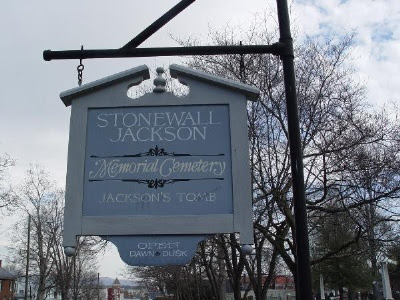 Image: Sign at the Stonewall Jackson Memorial Cemetery in Lexington, Virginia where Jackson and 144 other Confederate veterans are buried. In Life and Campaigns, Dabney gives great emphasis to Jackson’s unwavering “belief in the control of Divine Providence” which was “most rational and scriptural" (p. 98). It was this profound trust in God’s guidance in all circumstances that gave Jackson his famed calm and fearlessness in battle. According to Dabney it also made him “a happy man" (p. 110). “His habitual frame was a calm sunshine. He was never desponding, and never frivolous" (p. 110). His pastor said “that he was the happiest man he ever knew" (p. 111). The proof of Jackson’s firm confidence in the Lord’s providential guidance of all things, came in the difficult and sorrowful moments of this life. In 1854, he lost his first wife, Eleanor Junkin, after only fourteen months of marriage. Dabney observes: “It is related that his grief was so pungent, as not only to distress, but seriously to alarm his friends. Yet even then he was most anxious not to sin by questioning in his heart the wisdom and rectitude of God’s dealing with him" (p. 115). I was not surprised that little M. was taken away, as I have long regarded his father’s attachment to him as too strong; that is, so strong that he would be unwilling to give him up, though God should call for His own. I am not one of those who believe that an attachment ever is, or can be absolutely too strong for any object of our affections; but out love for God may not be strong enough. We may not love Him so intensely as to have no will but His (p. 120). You see me severely wounded, but not depressed; not unhappy. I believe that it has been done according to God’s holy will, and I acquiesce entirely in it. You may think it strange; but you never saw me more contented than I am today; for I am sure that my Heavenly Father designs this afflictions for my good. I am perfectly satisfied, that either in this life, or in that which is to come, I shall discover that what is now regarded as a calamity, is a blessing. And if it appears a great calamity, (as it surely will be an inconvenience, to be deprived of my arm,) it will result in a great blessing. I can wait, until God, in his own time, shall make known to me the object he has in thus afflicting me. But why should I not rather rejoice in it as a blessing, and not look on it as calamity at all? If it were in my power to replace my arm, I would not dare to do it, unless I could know it was the will of my Heavenly Father (p. 707).